Is there life after Trunki (Part I)? There has been a lot of discussion in the legal and business media following the recent Supreme Court decision in the Trunki case, PMS International Group Plc v Magmatic Limited  UKSC 12. In the first of two newsletters Darren Mitchell and Deborah Maxwell (both of whom trained as product designers before entering the intellectual property profession) summarise the main findings in the case. 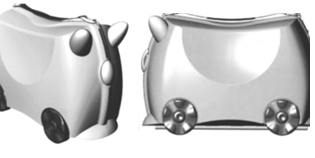 In the judgement the Supreme Court rejected the appeal filed by Magmatic (owners of the Community registered design (“CRD”) directed to the Trunki ride-on suitcase) against the Court of Appeal’s earlier decision that PMS International Group Plc’s ride-on Kiddee Case did not infringe Magmatic’s CRD. The colour contrast in the CRD between the grey body and the black wheels stood out as a feature of the design and differed from the Kiddee Case (which has its wheels largely covered). The decision highlights the importance of giving careful and thorough consideration to the representations when filing a CRD. In particular an applicant for a registered design must carefully evaluate whether to file versions of a design with differing contrast patterns and differing surface designs. The Community registered designs system allows the inclusion of such variants under the umbrella of protection at relatively low cost; and it seems this factor influenced the Supreme Court to interpret Magmatic’s rights more narrowly than some observers were expecting. In Part II of this newsletter Darren and Deborah will provide some practical tips on how best to protect designs of consumer products in a post-Trunki landscape.